A fantastic prize or gift for your Sunday school. These colourful wooden crosses help children to remember the words of the Lord's prayer. 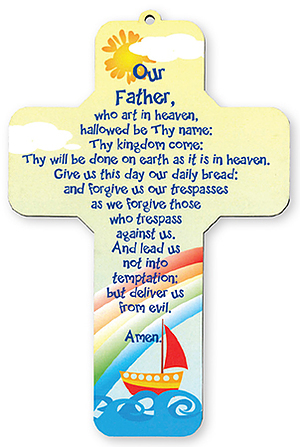 Designed for children's bedrooms or the Sunday school room this lazer cut wooden cross presents the words of The Lord's Prayer in a bright and colourful way. Size of the cross: 4 3/4" x 7 1/4"
Lord's Prayer Children's Wooden Cross Plaque is published by CBC Distributors and is our 486th best seller. The ISBN for Lord's Prayer Children's Wooden Cross Plaque is 12481. Got a question? No problem! Just click here to ask us about Lord's Prayer Children's Wooden Cross Plaque.